Laissez-faire leadership, also known as delegative leadership, is a type of leadership style in which leaders are hands-off and allow group members to make the decisions. Researchers have found that this is generally the leadership style that leads to the lowest productivity among group members. However, it is important to realize that this leadership style can have both benefits and possible pitfalls. There are also certain settings and situations where a laissez-faire leadership style might be the most appropriate. Knowing your dominant leadership style can be helpful for understanding your own strengths and potential weakness. There have been a number of well-known political and business leaders throughout history who have exhibited characteristics of a laissez-faire leadership style. Steve Jobs was known for giving instructions about what he would like to see to his team but then leaving them to their own devices to figure out how to fulfill his wishes. Former U.S. President Herbert Hoover was famous for taking a more laissez-faire approach to governing, often by allowing more experienced advisors to take on tasks where he lacked knowledge and expertise. Like other leadership styles, the delegative approach has both a number of benefits and shortcomings. Sometimes this style can be effective, particularly if it is used appropriately in the right settings and with groups that respond well. When team members have the skills to succeed. Laissez-faire leadership can be effective in situations where group members are highly skilled, motivated, and capable of working on their own. Since these group members are experts and have the knowledge and skills to work independently, they are capable of accomplishing tasks with very little guidance. When group members are experts. The delegative style can be particularly effective in situations where group members are actually more knowledgeable than the group's leader. Because team members are the experts in a particular area, the laissez-faire style allows them to demonstrate their deep knowledge and skill surrounding that particular subject. When independence is valued. This autonomy can be freeing to some group members and help them feel more satisfied with their work. The laissez-faire style can be used in situations where followers have a high-level of passion and intrinsic motivation for their work. While the conventional term for this style is 'laissez-faire' and implies a completely hands-off approach, many leaders still remain open and available to group members for consultation and feedback. They might provide direction at the beginning of a project, but then allow group members to do their jobs with little oversight. This approach to leadership requires a great deal of trust. Leaders need to feel confident that the members of their group possess the skills, knowledge, and follow through to complete a project without being micromanaged. Laissez-faire leadership is not ideal in situations where group members lack the knowledge or experience they need to complete tasks and make decisions. This style of leadership has been linked to negative outcomes including poor job performance, low leader effectiveness, and less group satisfaction. Some people are not good at setting their own deadlines, managing their own projects and solving problems on their own. In such situations, projects can go off-track and deadlines can be missed when team members do not get enough guidance or feedback from leaders. Lack of role awareness. In some situations, the laissez-faire style leads to poorly defined roles within the group. Since team members receive little to no guidance, they might not really be sure about their role within the group and what they are supposed to be doing with their time. Poor involvement with the group. Laissez-faire leaders are often seen as uninvolved and withdrawn, which can lead to a lack of cohesiveness within the group. Since the leader seems unconcerned with what is happening, followers sometimes pick up on this and express less care and concern for the project. Low accountability. Some leaders might even take advantage of this style as a way to avoid personal responsibility for the group's failures. When goals are not met, the leader can then blame members of the team for not completing tasks or living up to expectations. Passivity and avoidance. At its worst, laissez-faire leadership represents passivity or even an outright avoidance of true leadership. 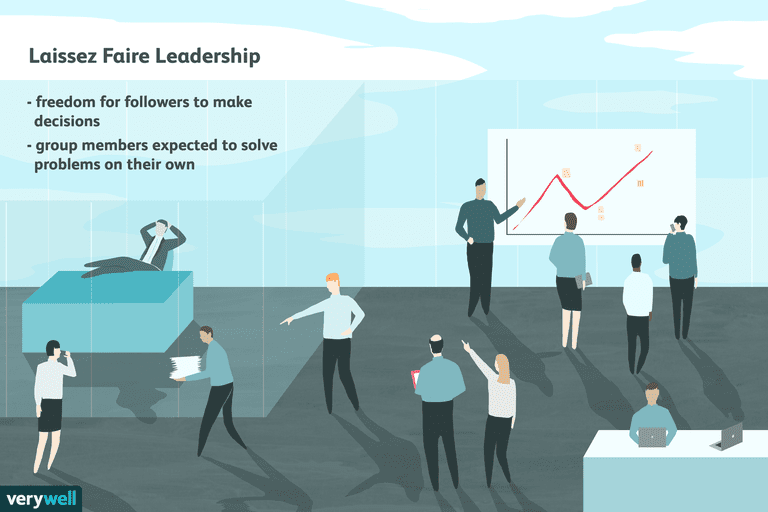 In such cases, these leaders do nothing to try to motivate followers, do not recognize the efforts of team members, and make no attempts at involvement with the group. If group members are unfamiliar with the task or the process needed to accomplish the task, leaders are better off taking a more hands-on approach. Eventually, as followers acquire more expertise, leaders might then switch back to a more delegative approach that gives group members more freedom to work independently. If you tend to have a more laissez-faire approach to leadership, there are areas and situations where you might tend to do better. Working in a creative field where people tend to be highly motivated, skilled, creative, and dedicated to their work can be conducive to obtaining good results with this style. For example, a delegative leader might excel in a product design field. Because team members are well-trained and highly creative, they likely need little in the way of management. Instead, an effective leader can provide minimal oversight and guidance and still produce high-quality results. Laissez-faire leaders typically excel at proving information and background at the start of a project, which can be particularly useful for self-managed teams. By giving team members all that they need at the outset of an assignment, they will then have the knowledge they need to complete the task as directed. Even in such fields, it may pay to utilize a variety of leadership approaches at different phases of the work process. For example, laissez-faire leadership may be most effective during the early phases when a product or idea is being brainstormed or created. Once the design is in place and ready for production, it may be best to switch to a style that involves more direction and oversight. A leader with this style may struggle in situations that require great oversight, precision, and attention to detail. In high stakes and high-pressure work settings where every detail needs to be perfect and completed in a timely manner, a more authoritarian or managerial style may be more appropriate. Using a laissez-faire approach in this type of scenario can lead to missed deadlines and poor performance, particularly if group members are unsure of what they need to be doing or do not have the skills they need to perform tasks with little to no direction. The laissez-faire style of leadership is often dismissed as one that leads to poor group outcomes, but it can be appropriate and effective in a variety of situations. In setting where group members are highly skilled and motivated, it can actually produce excellent results. Because team members get to exercise a great deal of freedom free from excessive micromanaging, they often feel more inspired and creative. Cragen, JF, Wright, DW, & Kasch, CR. Communication in Small Groups: Theory, Process, and Skills. Boston: Wadsworth; 2009. Schyns, B & Hansbrough, T. When Leadership Goes Wrong: Destructive Leadership, Mistakes, and Ethical Failures. Charlotte: NC: 2010.